Doha, Qatar, March 23, 2016: Her Highness Sheikha Moza bint Nasser, Chairperson of Qatar Foundation for Education, Science and Community Development (QF) called for greater investment in research and development across the region yesterday, and highlighted Qatar’s pioneering approach to the issue. Her Highness Sheikha Moza’s comments were delivered during her Leadership Address at the official opening of the two-day QF Annual Research Conference 2016 (ARC’16). Her Excellency Sheikha Hind bint Hamad Al Thani, Chief Executive Officer and Vice Chairperson of Qatar Foundation, was in attendance alongside dignitaries, senior officials and more than 2000 delegates from around the world. Held under the theme ‘Investing in Research and Innovating for Society’, this year’s conference attracted internationally renowned industry experts from a variety of fields. The Opening Plenary Session delved into ‘Strategic Investment in Research and Innovation for Society’. Panelists included Dr Hassan Al-Derham, President of Qatar University; Dr Elias Zerhouni, President of Global R&D, Sanofi, France, and Former Director of the National Institutes of Health, USA; Mr Suresh Sachi, Deputy Managing Director of Agency for Science, Technology and Research (A*Star), Singapore; and Mr Christopher Coburn, Vice President, Innovation, Partners HealthCare, USA. The Keynote Panel Discussion was moderated by Dr Maher Hakim, Associate Professor of Entrepreneurship at Carnegie Mellon University in Qatar (CMU-Q). Presented by Her Excellency Sheikha Hind bint Hamad Al Thani, the QF R&D Best Research Project Award was awarded to Dr Shehab Ahmed, Associate Professor in Electrical and Computer Engineering at Texas A&M University at Qatar for his work on power electronics. Funded by QNRF, the project focuses on the development of power electronics and systems for the integration of renewable energy into the power grid. The Best Innovation Award was presented to Dr Adnan Abu-Dayya, Executive Director and CEO of Qatar Mobility Innovations Center (QMIC) for Masarak™- iTraffic. Masarak™- iTraffic is an intelligent traffic monitoring and navigation application developed and deployed by QMIC in partnership with the Ministry of Municipality and Planning. QMIC is the first independent innovations centre in the region and is located at Qatar Science and Technology Park. 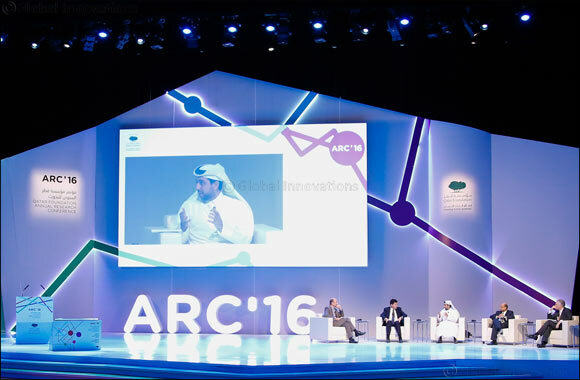 The second and final day of ARC’16 will feature a series of newly incorporated events by Qatar National Research Fund (QNRF), a member of QF R&D. The announcement of the QNRF Funding Programs Outcomes including the NPRP 9th Cycle, Path Towards Personalised Medicine (PPM) and OSRA research grants will take place on the second day of the conference. ARC’16 will conclude on March 23 with the announcement of the ARC’16 Awards recognizing the Best Student Poster Presentations, Regular Poster Presentations and Best Research Presentation in the fields of Energy and Environment, Computing and Information Technology, Health and Social Sciences and Arts and Humanities. In addition, the Best Research Office of the Year Award for 2015 will be announced alongside the winners of the 8th Undergraduate Research Experience Programme Competition Awards, the Best Representative Image of an Outcome Competition Awards, Qatar Science, Technology, Engineering, Art and Math (STEAM) Fair Awards and the Qatar Research Leadership Programme (QRLP) Graduates Recognition.